Discussion in 'Rugby League Forum' started by HappilyManly, Jun 20, 2017. Sharks 18 (Luke Lewis, Sosaia Feki, Wade Graham tries; James Maloney 3 goals) at Southern Cross Group Stadium. This thread is free! Woot! 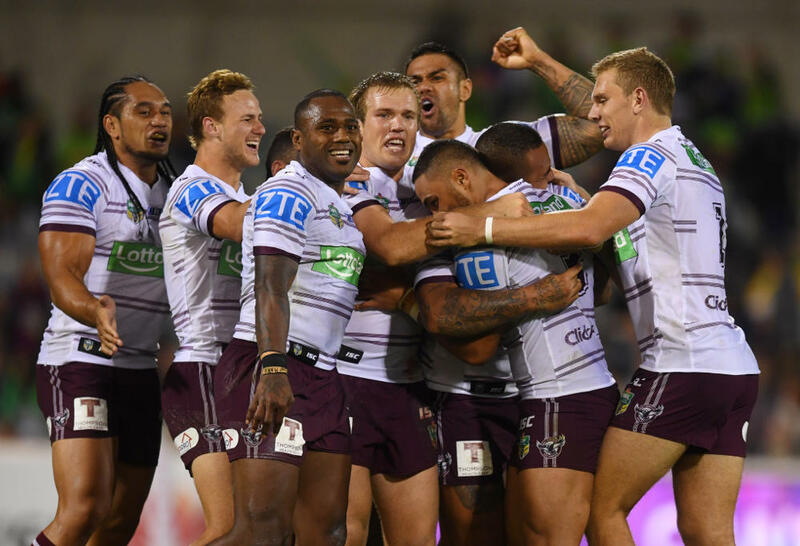 Not that it wasn't important enough already; but with the roosters, Nth Qld, and the Broncos all winning....the Manly men really have an important game on their hands! Its 3.57 am. Nothing to report yet. 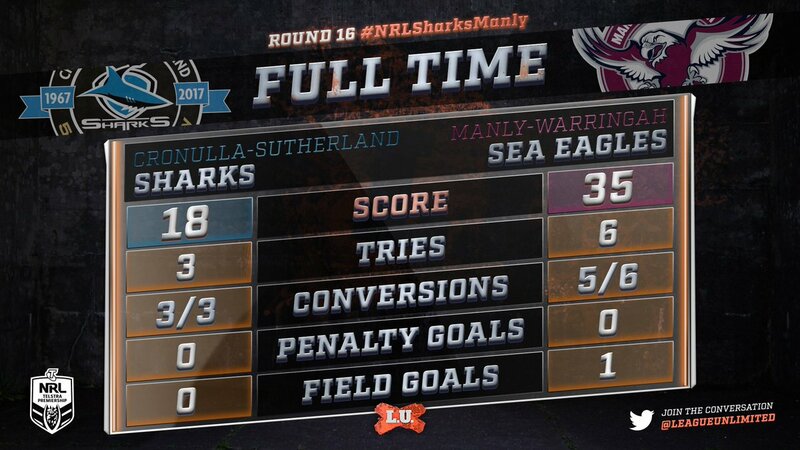 Sea Eagles havent arrived at the ground but I understand there's a few sharks lurking off Wanda Beach. This game is a toss of a coin, it really could go either way. If we can win with no injuries it would put us in a great spot. Go Manly!!! Our beaches are better than theirs. I'm sure that was just some fish. An away game and the men have been in camp! Positive signs aplenty! What a shame parra has the bye. Robs us of having a chance at a lol @ parra weekend. Maybe we could have a lol at the Wallabies thread. Agreed GE. After results so far this weekend, we win today we play finals. Simple. And at 6 pm they'll be gummy sharks.. Excited much ohhh yeah. This is a season defining game. We rip in a big one here and earn a win then it sets us up for a big run to the finals. That's too positive Mick - you're gonna jinx us. Yes they have the bye, but there's every chance that we read about some Parra headline tomorrow. "Another DV charge for Parra player" "More drug busts at the blue and gold" "Coach Arfur jailed for his part in salary cap cheating". A real test today , TBH we haven't exactly set the world on fire against the other sides above us BUT we have been improving steadily and they are sort of about the same. Have a feeling we will miss those off the line metres by Jorge, but the positive is a decent goal kicker which in what could be a tight game is a big plus. Agree toss of the coin, either a healthy win by the Sharks ( 8 plus) or us in a very tight one by about 2. Everyone is so extra pumped for a Manly game, I'm scared if we do lose I might stay off here for a week, it could get messy. Get behind the lads today and remember we're all on the same side! Let's get the win ! Nay mate ... as long as we have a go there is no disgrace losing to the premiers and team coming 3rd. By definition, saying we are top 6 material implies we should get beaten by the teams 1-5. Having said that ... fuk Flannigan .. fuk gallon .. and fuk the Sharkies. Go Manly flog the bassttards!